Designing Digitally, Inc. is an expert in developing immersive and meaningful learning experiences using Virtual Reality (VR). VR is one of the newest platforms to reach the training realm and is, without a doubt, the most engaging technology in our industry. It is proven to create enthusiasm for learners as well as strong knowledge retention. We create custom training simulations for Virtual Reality headsets such as the Oculus Rift and the HTC Vive. Our VR projects include realistic training simulations, immersive serious games, and fun mini-games. We design and develop every project around your audience and your training objectives. Our team agrees that out of all our learning solutions, VR projects are the most interesting to create, and especially the most fun to test! But we don’t just create them for fun. We create them to help our clients thrive by having motivated, educated employees. Contact one of our Learning Solutions Specialists today to discuss creating your custom Virtual Reality Training Experience! Virtual Reality Learning Experiences can be extremely beneficial to companies because they use a high fidelity of realism that has never been experienced before. By implementing VR Learning Simulations, Designing Digitally can develop your training to be immersive, engaging, and entertaining for your audience. Your staff can practice procedures that are dangerous or involve costly equipment in a safe, risk-free environment. We can design your immersive VR experience to replace your current on-the-job training or to supplement your existing curriculum or onboarding program. Since we design each project to meet your needs, the sky's the limit when it comes to implementation! Our team has developed VR experiences for some of the largest brands in the world. We have launched our VR games, such as Chop and Drop, on distribution platforms like STEAM, the Apple iOS Store, and the Google Play store. Our experienced Instructional Designers can take your ideas and training goals to the virtual realm. We combine our game development prowess with sound instructional methodologies to create training experiences that foster performance improvement. Together, our team has over a decade of experience developing virtual reality learning experiences for some of the largest brands in the world. An Instructional Designer will collaborate with your organization to conduct a rigorous analysis to determine the best approach to your VR project, which helps us ensure it produces a strong learning outcome. Designing Digitally, Inc. uses leading-edge augmented reality & virtual reality systems to develop immersive learning experiences, which provide real results for clients. Our VR developers build custom solutions for a range of platforms, including the HTC Vive, Oculus Rift, PlayStation VR (PSVR), and Samsung Gear VR. This technical expertise, combined with our experience creating award-winning Serious Games, makes Designing Digitally, Inc. a top developer for VR training simulations. We will collaborate with you during our Determine process to identify the best approach to technology for your organization, based on your equipment budget, training goals, and audience characteristics. Deciding to partner with a development company to create your online training can be an incredibly beneficial decision, especially when you choose the right company. Designing Digitally, Inc. uses a thorough production process that maximizes time, prevents scope creep, and maintains the agreed-upon budget. We have created immersive learning simulations for the biggest brands in the world, including U.S. Government agencies and universities. 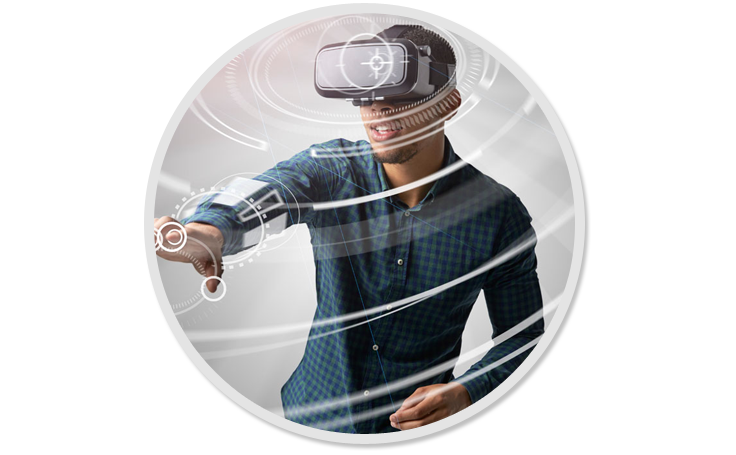 To learn more about how Designing Digitally can develop your custom VR training simulation, contact one of our Learning Solutions Specialists today.